Damson showcases mini soundbar and budget multi-room system | What Hi-Fi? If you're interested in saving space and money but still want the option of surround sound and multi-room functionality, the Damson S-Series might be just the thing. Damson is looking to build on its existing headphones and wireless speakers with a new wireless speaker range, complete with multi-room functionality. In an increasingly crowded space that's been bossed by Sonos in recent years, the company hopes affordable prices and micro-sized speakers will help the Damson S-Series find its own corner of the market. A crowd-funding campaign is up and running for the new products, though Damson suggests this is to raise awareness and offer early supporters cheaper prices, rather than being a necessary part of the project. The first products are scheduled to reach the market in time for Christmas. The S-Series features three products: the S-Bar soundbar, the S-Woofer sub and the portable S-Cube wireless speaker. The S-Bar measures just 25cm wide and has an HDMI input, USB Type C input for charging, as well as other analogue and digital audio connections. The S-Cubes also sport USB Type-C and aux inputs. 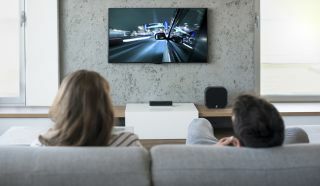 The speakers connect to each other using the company's own wireless technology, and can be set up in individual rooms or to form a surround sound system using S-Cubes as rear speakers, in a similar way to the Sonos system. Connection from your music source to the speakers is via Bluetooth. There's no Damson control app, so playback is via your app of choice on your device, whether that's streaming or playing downloaded music. Find out more on the Damson S-Series crowd-funding page.